Can’t believe this is November already. Temperatures have been dropping into the 50s and even upper 40s at night, wonderful fall weather for the Broward. The Editor wants the fireplace turned on already. I have been anxious to get back out on the Kayak and finally got a chance this past week. The morning sky looked promising at first but then the low clouds rolled in blocking the early morning light. Still anxious, I can’t wait to catch the tide to float the Kayak so I drag it down the neighbors’ pier to launch into the channel. Old Man River the Great Blue Heron lifts off before I can even get close. But I am free and floating. I head for the Secret Broward Bird Hideout. Sure enough I see all kinds of white feathers dotted on the tree limbs but no Roseate Spoonbills. One was on the dock the night before for a brief moment so a few are still in the area. 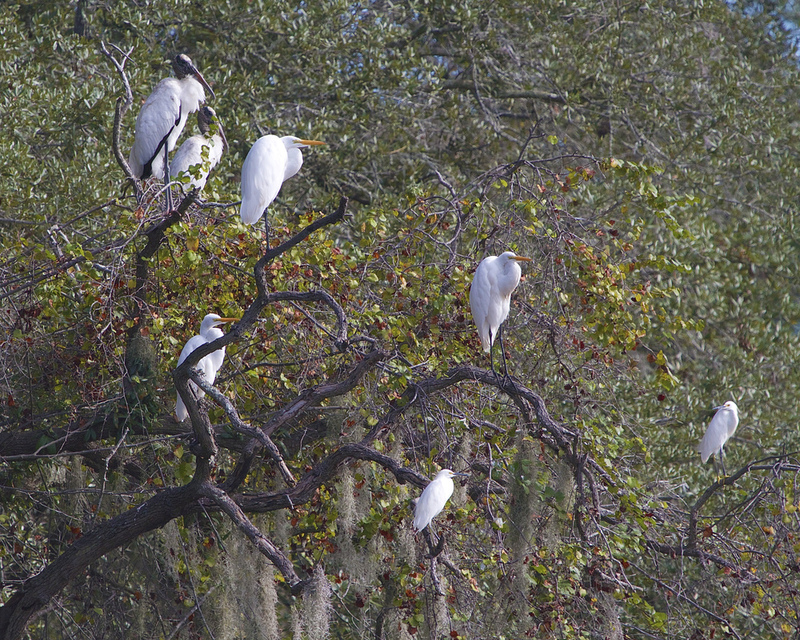 There are Wood Storks, Great and Snowy Egrets, a Black Crowned Night Heron and even a Great Blue Heron. A pair of Anhinga circle overhead. I am surprised how close the birds let me approach before they lift off and fly over the creek to the other side. A few pay me no attention and just keep an eye on me as I push the doohickey. Not wanting to disturb them any longer, I head up the Broward. High overhead I watch an Osprey dive for breakfast. It is a miss this time. I get several fly-bys from some of the Great Egrets. One was so close I felt I could almost reach out and touch it. Had it not been so dark from the clouds they would have been really great photos. But I still enjoy the sight of these birds on wing. Old Man River, the Great Blue Heron spots me and takes off again with a blackbird in pursuit. I see Storks, Egrets and Herons as I approach the Secret Broward Bird Hangout. Too close for comfort, the liftoff begins. I am almost to the tree before the Wood Storks get nervous. 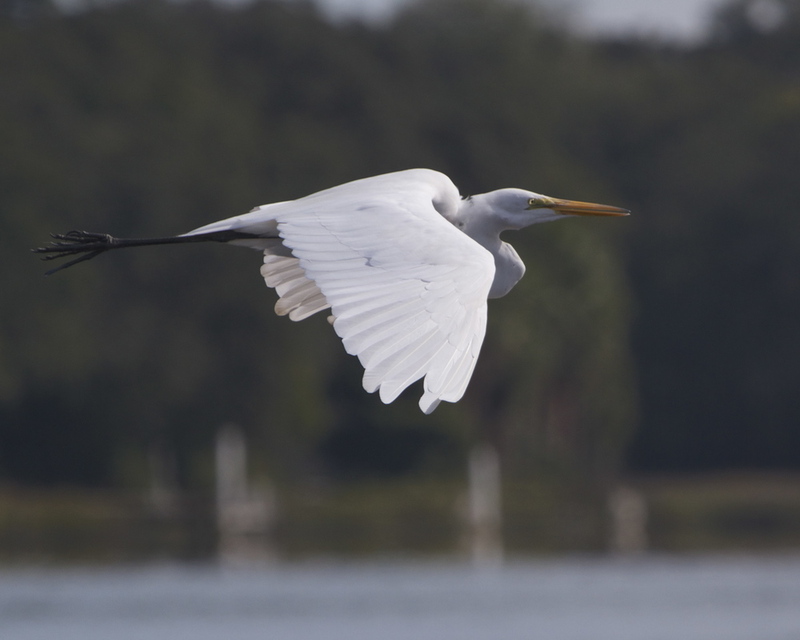 Great Egret fly by. I could almost touch it. Tricolored Heron on wing goes by. Black Crowned Night Heron flyover in the dark early morning sky. Osprey high overhead searches the Broward for breakfast. The Osprey goes into a dive! But misses and takes off, no fish for breakfast,,,yet. Little Blue Heron greets me on dock as I return. This house sure looked bigger on the internet photos. Red Shouldered Hawk inspects the yard. Front profile shot, Red Shouldered Hawk. Gotta fly,,see ya next time!